I seen this recipe on Rachael Ray’s show last week.. It looked soooooo Goooood! So of course I HAD to try it! Turns out it is by far DELICIOUS & super easy to make! Melt butter over medium heat in a small skillet; swirl with garlic for 2 minutes. Pour butter and garlic over breadcrumbs and cool. Toss with cheese and fresh herbs. Drizzle chicken with EVOO and season both sides with salt and pepper. Slather each piece of chicken with mustard and press that side into the breadcrumb-and-cheese mixture. Arrange chicken on nonstick or parchment-lined baking sheet and bake 20 minutes or until juices run clear and breadcrumbs are deeply golden. My Creation of the Herb & Cheese Baked Chicken! I then paired this chicken with rice & a parsley salad. I am not a huge fan of parsley, however I thought I would try it ( as Rachael Ray said it goes perfectly with the chicken). It was good.. but I think next time I will substitute the parsley for spinach instead. Parsley, Tomato, Red Onion, Olive Oil & Salt & Pepper to taste.. Mix & Enjoy! 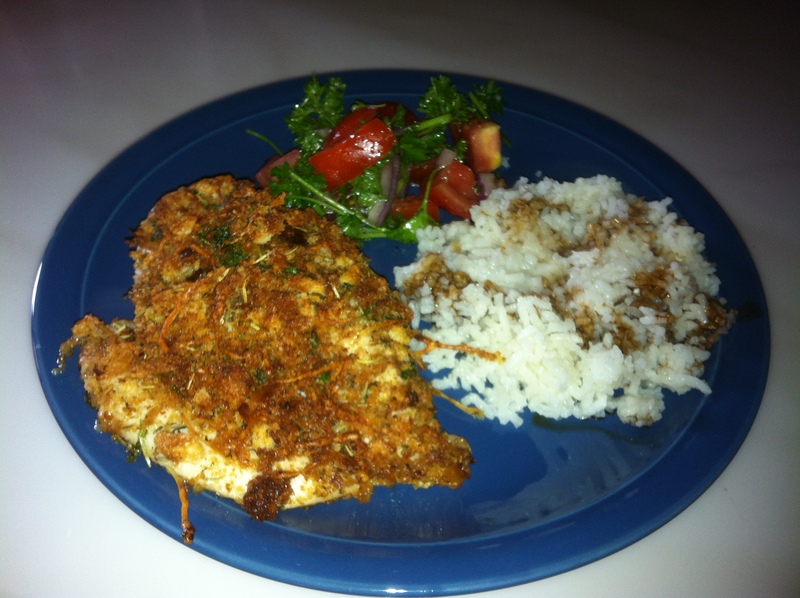 This chicken took me NO time to prepare & it was a huge HIT at the dinner table! Plus the best part is you don’t have to follow the herbs to a tee… you can mix in your favorite herbs instead… you can’t go wrong! Give it a try & let me know how it turns out!